The Mitsubishi ASX is the firm’s answer to the Nissan Qashqai and Skoda Yeti. It’s been around since 2010, but has always been a relatively rare sight on UK roads because it was a little too pricey. But the 2014 model year ASX driven here is around 10 per cent cheaper than before, despite having more kit. Mitsubishi has also introduced this new flagship model, which borrows the 2.2-litre diesel and six-speed auto gearbox from the larger Outlander. A press of the starter button kicks the engine into life with a fair old clatter. Wriggle the gear lever through its gate into D and the ASX moves off smoothly. The initial response from the throttle is a little disappointing, as it doesn’t seem to have the pace implied by the 10.8 seconds Mitsubishi claims for the 0-62mph sprint time. However, once you’re up and running, the car feels much more urgent and responsive, helped by the fact that the gearbox does a slick job of adapting the way it shifts to suit how you’re driving. It responds reasonably well to manual shifts too, either by moving the gearlever or using the paddles fixed to the steering column. The engine remains pretty noisy whenever you’re accelerating, and never fully quietens down at a cruise, despite Mitsubishi adding more sound deadening to this updated model. There’s a fair bit of noise that comes up through the wheels and tyres, too. The ASX is quite comfortable on smooth roads, but bumps and ridges in the tarmac make the car fidget around more than rivals like the Yeti. There’s also a bit too much body roll, exacerbated by seats that don’t have enough support for your upper body. The steering is vague, although the high driving position and relatively tight turning circle allow you to manoeuvre with ease. That said, rear visibility isn’t great, although this top-spec car does come with a very clear reversing camera as standard. The diesel auto is only available with four-wheel drive, but its default setting is front-wheel drive, which is fine for the vast majority of the time. You press a button between the seats to engage 4WD Auto mode, which sends up to 30 per cent of power to the back axle should the front wheels slip, while a second press locks the centre diff with equal power sent front and rear, and ensures the ASX can negotiate slippery grass and gravel with minimal bother. The ASX is pretty spacious, with a good-sized boot – although the rear seats don’t fold flat – and room for five. This ASX 4 model comes stacked with kit, including a new panoramic roof – although this sheds extra light on the rather bland cabin. 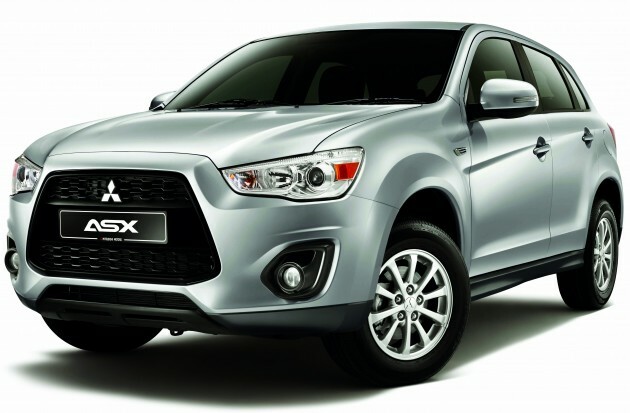 The price is now right for the ASX, and the car is practical, well equipped and easy to drive. However, despite the update, it feels like car that was competitive in 2010, and things have moved on quite a bit in the meantime.